NASA's Mars rover Curiosity captured this image on Jan. 2, 2018, with its Mars Hand Lens Imager (MAHLI). Using an onboard focusing process, the robot created this product by merging two to eight images previously taken by MAHLI, which is located on the turret at the end of the rover's robotic arm. Have trace fossils been found on Mars? In browsing the first new batch of 2018 photos taken by the Curiosity rover's Mars Hand Lens Imager (MAHLI), researcher Barry DiGregorio speculated on whether the Red Planet robot found trace fossils on Mars. DiGregorio is a research fellow for the Buckingham Centre for Astrobiology in the United Kingdom and author of the nonfiction books "Mars: The Living Planet" and "The Microbes of Mars." Curiosity Mastcam right image taken on Dec. 15, 2017. Vasavada reported that the eye-catching features are very small, probably on the order of a millimeter or two (0.04 to 0.08 inches) in width, with the longest of the features stretching to roughly 5 millimeters (0.2 inches). "So, they are tiny," he told Inside Outer Space. Serendipitously, they were first spotted in black and white imagery. The features were compelling enough for the science team to roll Curiosity back to examine them further, making use of MAHLI — a focusable color camera mounted on the rover's arm, Vasavada said. "These were unique enough, given the fact that we didn't know they were there … [that] we thought we should go back," Vasavada explained. Curiosity team member Christopher Edwards, a planetary geologist at Northern Arizona University in Flagstaff, also made note of the plan to wheel Curiosity back to study the dark-toned "stick-like" features. "This site was so interesting that we backtracked to get to where the rover was parked for this plan," Edwards wrote in a Jan. 3 mission update. "In the work space in front of the rover, we have some very peculiar targets that warranted some additional interrogation." The origin of these odd features — geological or biological processes — is in TBD limbo at the moment. Regarding trace fossils on Mars, "we don't rule it out," Vasavada said, "but we certainly won't jump to that as our first interpretation." Close-up looks at these features show them to be angular in multiple dimensions. That could mean that they are related to crystals in the rock, perhaps "crystal molds" that are also found here on Earth, Vasavada added. Crystals in rock that are dissolved away leave crystal molds, he said. Curiosity scientists have been discussing the newly found and novel features, attempting to figure out just what they signify, Vasavada said. In the end, however, can the Mars robot differentiate a crystallization process from a biological one? "That's pretty challenging on Earth to distinguish those two things without being able to put these things into a lab to look for the presence of organics," Vasavada said. "We have a very limited capability overall to understand whether something is biological or not." Meanwhile, along with new MAHLI imagery, Curiosity's Chemistry and Camera (ChemCam) and its Alpha Particle X-Ray Spectrometer (APXS) are also inspecting the features for clues as to their nature. Curiosity ChemCam Remote Micro-Imager photo of novel stick-like features, taken on Dec. 31, 2017. "The Curiosity images really pique our curiosity," said Pascal Lee, a planetary scientist at the Mars Institute and SETI (Search for Extraterrestrial Intelligence) Institute in Mountain View, California. Still, given the imagery, "it's hard to tell what the wiggly sticks are," he said, "and a strictly mineral origin is, of course, the most plausible." But on first view of the features, Lee said that as a field geologist, "the immediate thought that came to my mind is bioturbation." This is the process through which organisms living in sediments can disturb the structure of these sediments. "A common example of bioturbation is the formation of worm burrows. The burrows, once refilled with sediments, fossilized and then exposed by erosion, can end up looking like wiggly sticks," Lee told Inside Outer Space. Is any of this relevant to Mars? 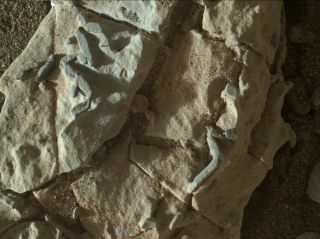 "Well, bioturbation at the scale of the features seen in the Curiosity imagery would imply macroscopic multicellular organisms at work, so something that would have evolved far beyond unicellular life," Lee said. "To claim that we're seeing bioturbation on Mars — which I did not say — would be an extraordinary claim." Lee added that he's reminded of what famed astronomer Carl Sagan used to say: "Extraordinary claims require extraordinary evidence." The upshot of the Curiosity observations is the need for a lot more evidence to make any such claim, Lee said — including evidence that allows ruling out less-extraordinary claims. "But I have to say, the imagery is really intriguing, and I hope Curiosity spends more time in the area to get to the bottom of this," Lee concluded. "This is exciting!" Another physical process could also explain the existence of structures that look like bioturbation, said astrobiologist Dirk Schulze-Makuch, a professor at Technical University of Berlin in Germany and an adjunct professor at Arizona State University and Washington State University. "Cool, looks like bioturbation and would likely be as such identified if the image would be from Earth," said Schulze-Makuch, whose latest book, co-authored with MIT researcher William Bains, is "The Cosmic Zoo: Complex Life on Many Worlds" (Springer, 2017). "But concretions can look quite similar, and, in [the] case of Mars, it's … more likely concretions," he added, referring to formations of precipitated minerals.